The Woodlawn Teachers Institute is a program for teachers, grades 3 to 12 from across the region. Teachers are selected through an application process. As a team, they work on developing curriculum-based programs utilizing Woodlawn’s history, environs, and collections. 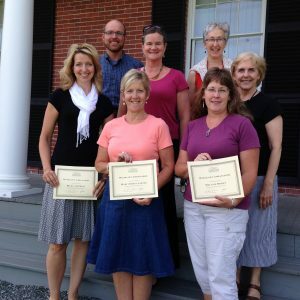 The Woodlawn Teachers Institute is held biennially, usually in the spring. The Institute offers teachers 20 hours of training in four sessions. In the first two sessions, the team explores the diverse opportunities to connect Woodlawn to curriculum using the cultural and physical landscape, art, local history, architecture, material culture, and the people of Woodlawn. In the remaining two sessions, the team works with a facilitator, and using their knowledge of Woodlawn, unique, educational programs are developed. The programs are then piloted in the fall of the year in each teacher’s classroom. In addition to participating, the students also help to evaluate the program. Once the pilot phase is completed, the teachers share their experiences with other educators. The goal of the Woodlawn Teachers Institute, is the successful development of diverse educational programs that expand Woodlawn’s role as a rich source of experiential learning for area students. Teachers participating in the Institute receive an honorarium and are required to attend all 4 sessions. As a 5th grade teacher, I have incorporated the many people associated with the Black family into my biography unit. If you are able to be a part of this Institute I would highly recommend it. It is a very organized and well-designed program that maximizes the time you are there. The Teachers’ Institute was a great way for me to connect a local resource to my 7th grade curriculum. Do not miss this opportunity to expand learning beyond the classroom walls. Discover Woodlawn. Your knowledge and enthusiasm will be contagious. What a gift for our students!